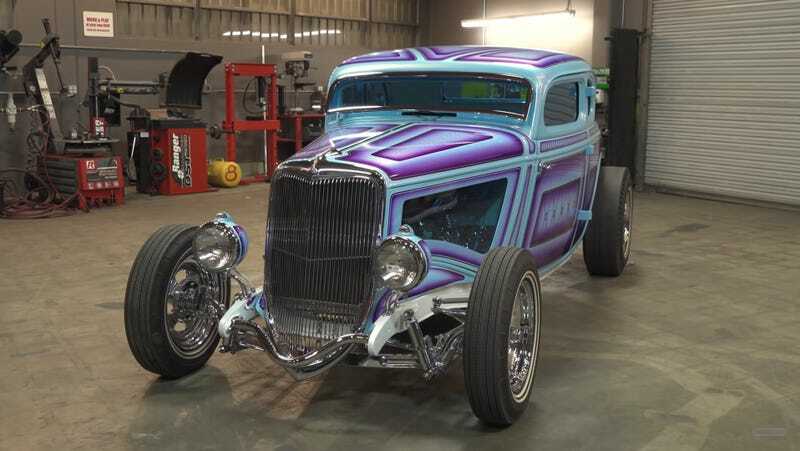 If you’re in the hot rod and custom world for more than twenty minutes you’ll hear someone say “there isn’t a single piece on the car that hasn’t been touched.” That usually denotes a build that is absolutely next level, where all of the nuts and bolts have been re-plated to original, or each body panel has been massaged in some way or another. This car takes anyone who has ever used that phrase out back for a serious talkin’ to. On one of our first dates, my now-wife and I went to the local fairgrounds for a hot rod and custom show in rural Michigan. While I was definitely a car person, she was merely willing to tag along. After looking at belly button rods (you know, because everyone has one?) for a little over an hour, we were ready to leave. There are only so many fiberglass ‘32 three-windows you can look at before you lose your mind, and I made my quote that day. I can firmly say that if a car like this one had been there, I would have pored over the details for another hour. There is no place you can look on this car and not be astonished. From the window in the sides of the hood showing off the 800-horsepower side-oiler big block up front to the incredible paint detail of the frame, this monster is pure eye candy. I can’t imagine how wild this must have been to see when it first rolled onto its display at the Detroit Autorama a few years back. It’s certainly got presence. One of the things I love about the Hoonigans channel is the pure variety of interest among the cast of characters in the shop. With each of them fitting a different niche and background, they’re almost like an automotive Avengers, you know?